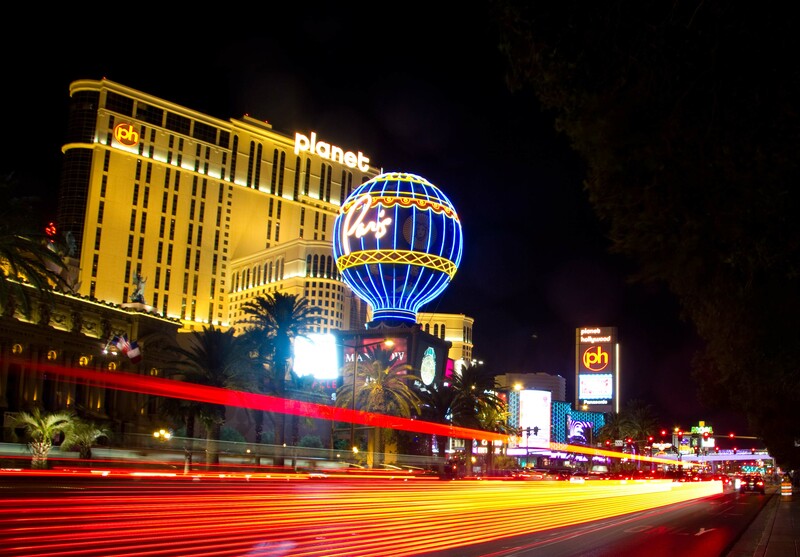 This trip to Vegas was to celebrate my dad’s 70th birthday. My brother, sister and I wanted to treat my dad to something special and seeing as we knew he’d enjoy a trip to the desert, here we are! I come from a family that loves food. But they aren’t the most adventurous or curious eaters. So once we find somewhere that’s good, we’ll just keep going back over and over. We first went to Lawry’s The Prime Rib for my brother’s 40th and my parent had a great time. So when we arrived in Vegas for my dad’s 70th, there wasn’t a question in their mind that we would return for our celebratory dinner. 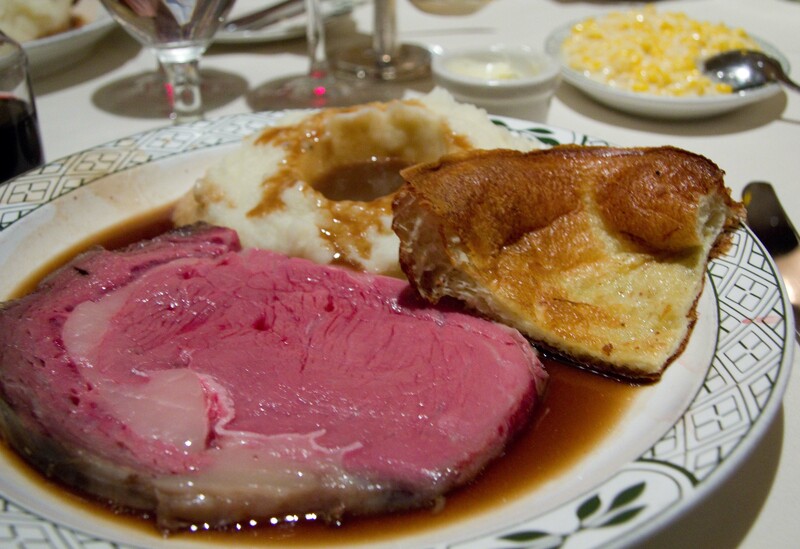 Lawry’s The Prime Rib is old school good. The room is decorated in Art Deco style and the servers just may be from that time too. 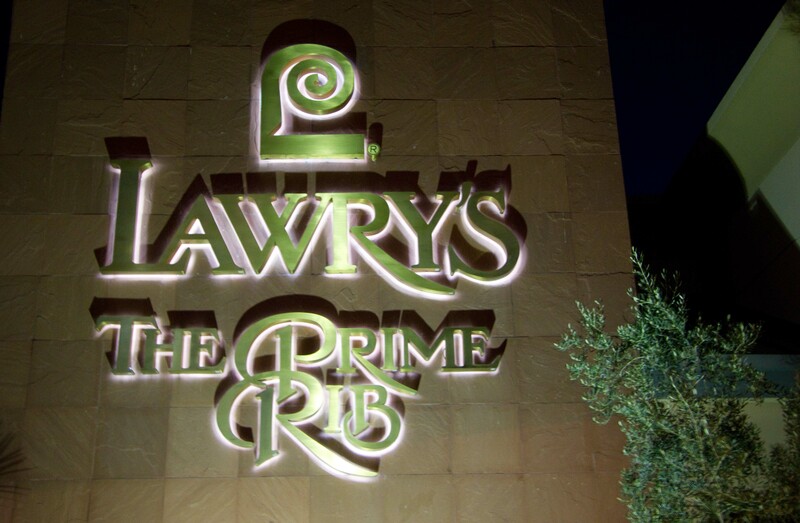 But if you’re looking for prime rib, and what I believe to be good value for it then Lawry’s is your place. I’m no saying it’s cheap, but considering you’re going out for an upper mid-scale meal in Vegas, you get a lot for what you pay for. Included in the price of all the meals is a salad, mashed potatoes and Yorkshire pudding. I ordered the smallest California cut, which was $32 and it was more than I could eat. First up was their “Famous Original Spinning Salad Bowl”, dressed with flair tableside. The salad has interesting bits of julienned cooked beets, crumbled up egg and nicely fried croutons. 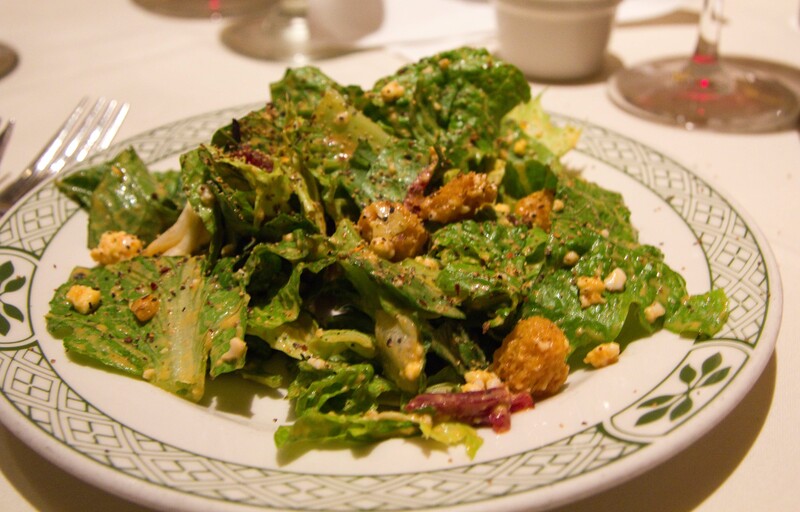 The dressing, is a cross between French and Thousand Island and bring me back to my childhood. You’re told to put some of the Lawry’s Seasoning Pepper on the salad to make it taste better. I’m easily convinced because I thought it did. After the salad, they roll out this huge cart of meat, where a man who proudly wears a humongous medal around his neck gets introduced as the carver. Your server is still there to take your order, but the medal wearing man carves your desired cut of meat for you. As I mentioned before, I got the smallest cut, the California which was approximately 1/2″ thick. My brother got the Lawry’s cut which was around an inch thick and came with the bone. For your reference, I ordered my prime rib rare. The meals were served with very creamy mashed potatoes, delightfully crispy Yorkshire pudding and gravy. You get your choice of whipped cream horseradish or the mind blowingly spicy regular kind. I need to mix the two together for it to be palatable. You can get a choice of vegetables on the side, but knowing that I’m not going to get through the meal on my plate, my first reaction was to say no thank you. 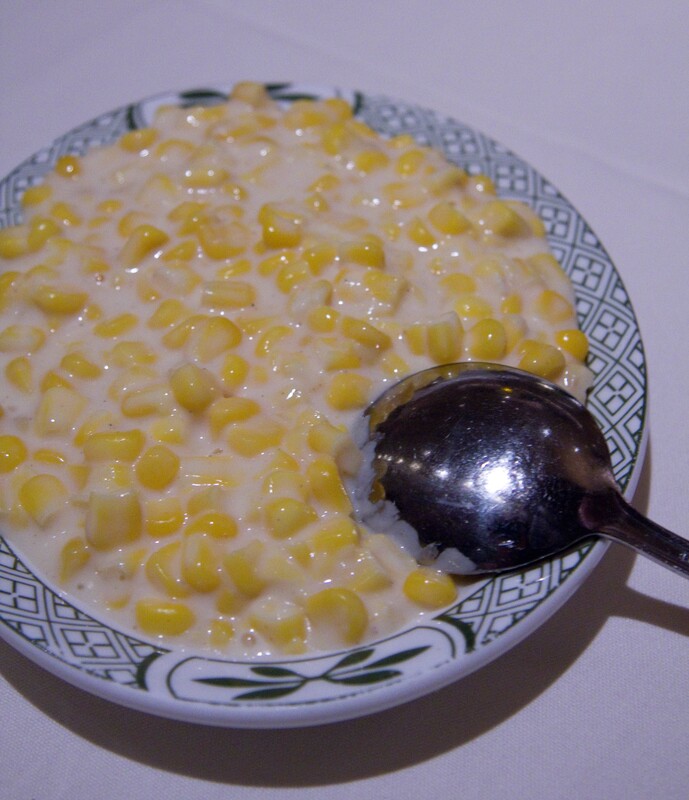 On the other hand, my family is known to overindulge, so at the last moment we ordered some creamed corn, which was deliciously rich, but it had so much cream and butter I don’t think it could be considered a vegetable anymore. I let the restaurant know we were celebrating my dad’s birthday, and they brought him out a piece of strawberry shortcake, which was delightfully moist. 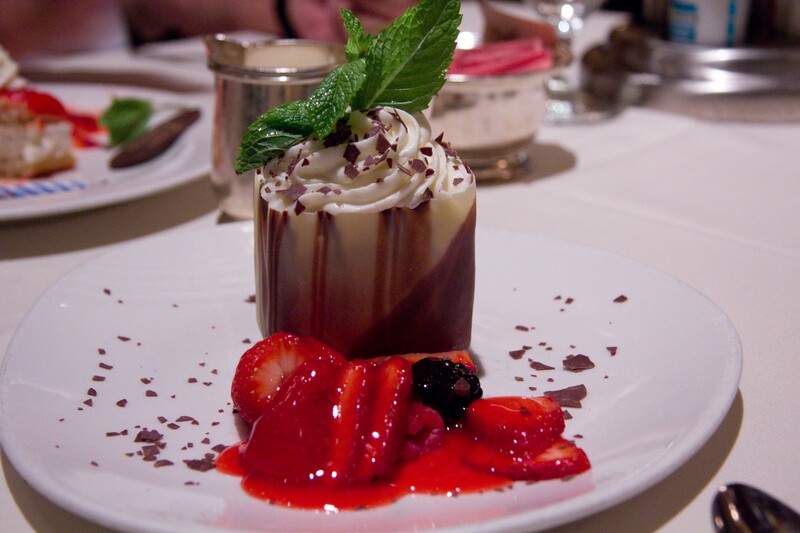 I was so stuffed by this time, but we ordered the Chocolate Bag, which was a molded chocolate bag filled with berries and a very light chocolate mousse. All I needed was just one bite to satisfy my chocolate craving. I’m happy that I learned to love food because of my parents. I’m also happy that they ask to be taken to the same places over and over again, because it generally results in a satisfying experience. Happy 70th Birthday dad! So full from the meal, my brother and I decided to try to walk it off by going to the strip to take some photos. Here’s my favorite of the night.